I love numbers. I’m one of those athletes that likes to track progress using data. Once I got a Garmin watch and set out to improve my half marathon time, I started tracking my pace, distance, time and other observations about my runs in an Excel spreadsheet. 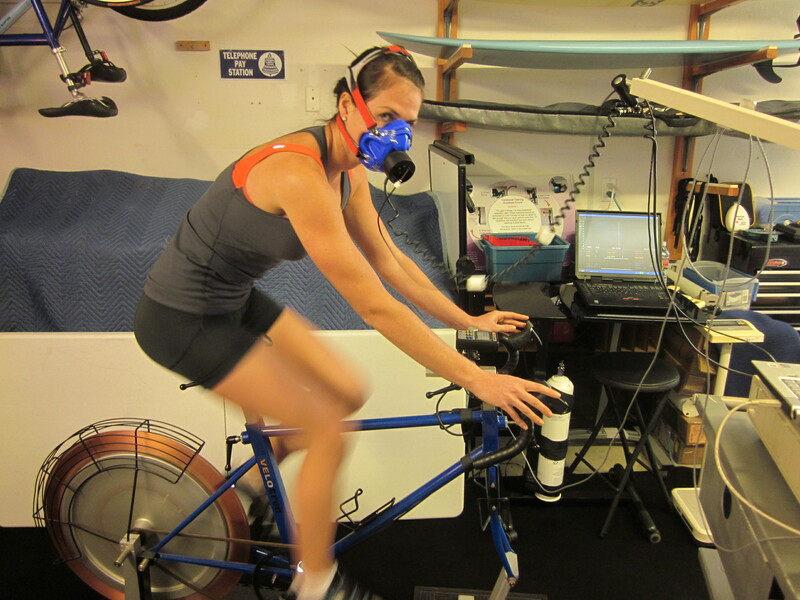 When I found that not one, but TWO of the bloggers that I follow (Lauren & Katie) wrote blog posts about getting a VO2 Max test done, I was so fascinated that I HAD to get mine tested as well. Let’s start from the beginning, what is V02 Max and why would I want to get it tested? V02 Max is defined as “the highest rate of oxygen consumption attainable during maximal or exhaustive exercise” (source). As we exercise harder, we also consume more oxygen. However, at some point exercise intensity can increase without an equivalent increase in oxygen consumption. This point is called the V02 Max. V02 Max is generally accepted as the best indicator of cardiovascular endurance and aerobic fitness. V02 Max is a mix of genetics (25-50%) and training. Some people’s V02 Max is easily influenced by training and others are less responsive. So why do I care what my V02 Max is? Although it’s fun to know how “big my engine is” (basically my fitness potential), the main reason that I got tested was to find out my heart rate zones. I’ve read several times that the biggest reason for a terrible Ironman experience is riding in the wrong heart rate zone. The higher the heart rate, the more calories from carbohydrates the body uses. Since we can only store 2,000 calories from carbs and can’t possibly eat enough calories to replace the ones we use without experiencing severe GI distress, it’s imperitive to learn to burn calories from fat instead. If you work in heart rate zones that are too high, you will burn nearly all of your calories from carbohydrates which will quickly deplete your small 2,000 calorie store and cause you to BONK, hard. Not ideal during a 12-17 hour race. You can perform this test on the bike or on the treadmill. The site recommends that if you can only get one test done that you test your “limiter.” At first I ignored this advice and signed up for the treadmill test because I felt that I’d do better at it since I’m more experienced. Plus I thought it was more in line with my long term goal of qualifying for Boston. However, after I read Lauren’s blog post about her testing on the bike, I sent Lauren a message on Twitter asking her why she chose the bike over the run. 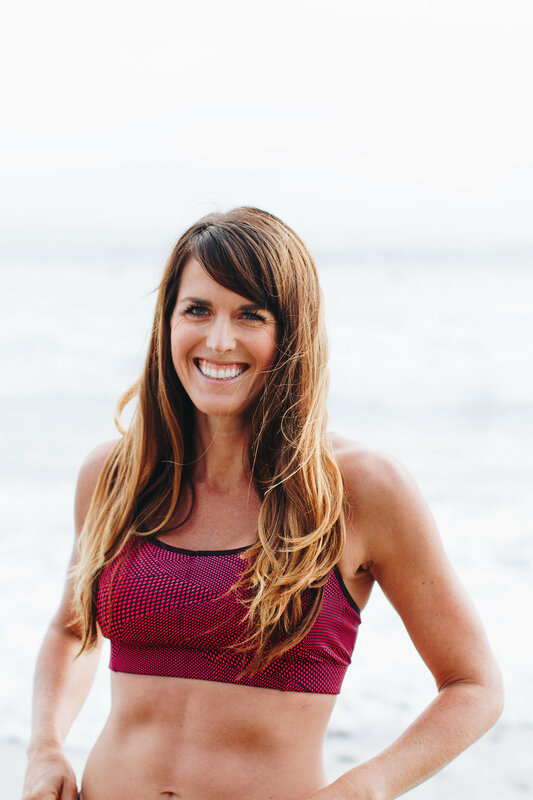 Lauren was very helpful and actually e-mailed me a message explaining that since you spend the majority of the Ironman on the bike, it’s important to know (and stay within) what your Zone 2 is. The key thing I took away from her email was “no one has a good run after a bad bike.” So true! Prior to my appointment, I was not supposed to engage in strenuous exercise for 48 hours and I couldn’t engage in any exercise for 24 hours prior. I ran 5 easy miles on Monday morning so by 2 p.m. Tuesday I was rested. I was also supposed to arrive in a “semi-fasted” state, meaning I couldnt’ eat more than 500 calories for 8 hours before my appointment and I couldn’t eat anything for the 2 hours prior. Ken from the Fit Stop was very welcoming. 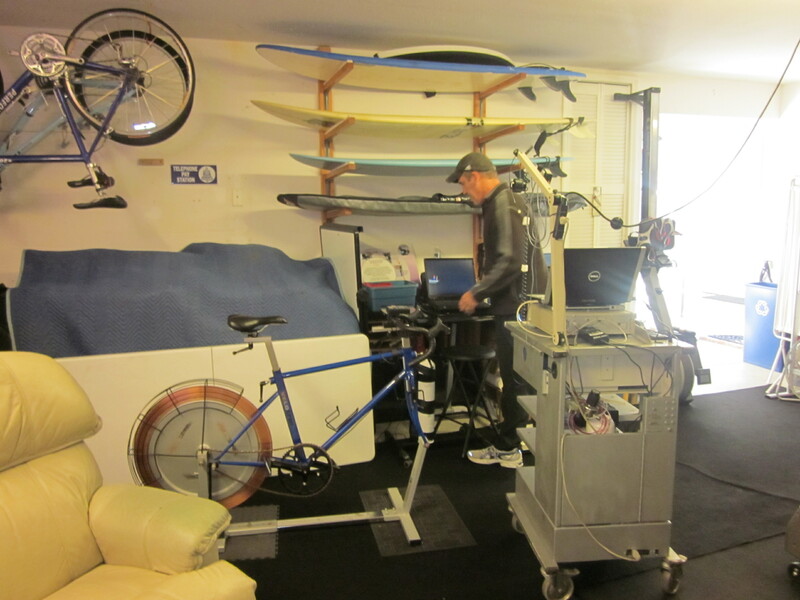 His lab is set up in his home garage and included a lot of high-tech looking equipment. We started the assessment with a discussion about my current fitness level, why I was getting tested and my upcoming races. I told Ken that I decided to do the cycling test was it is my limiter. I have only been cycling for 6 months. Next he took my height and weight, blood pressure and resting pulse. I was (pleasantly) surprised that my resting pulse was under 50. Ken set me up on the stationary bike. He attached my pedals (which I brought from my own bike) and made sure that the seat and handle bars were correctly adjusted. Once I was settled, he put a mask over my mouth and nose which measures the amount of oxygen that I’m putting out as a breath. After a five-minute warm-up, the test began. The test is performed in one minute segments. Each minute, the resistance on the bike gets harder and the number of watts that I’m producing goes up. I was told to keep my RPMs at 85-90 and that the test would end when my legs couldn’t physically pedal any faster than 70 RPM. Each minute, Ken held up a sign that showed a scale from 1-10 with each number representing perceived effort. Since number 5 was labeled as “hard” it took me a while to get up to that point. The first 10 minutes or so of the test wasn’t very demanding. However, once I got to hard, it got MUCH harder, as the resistance on the pedals got extremely tough to turn. My legs started to burn and my breath got harder and harder. Finally, I told Ken that I was at a 9.5 and he had me finish out the next minute. Once that minute was over, he asked if I could do another one, and I said no, and the test was over. I never noticed if my RPMs were under 70, but my breath was so labored that I felt there wasn’t any way I could go another minute. In retrospect, I think I could have gone several seconds longer, but since I knew I couldn’t do the full minute, I stopped the test. Ken started by telling me that for someone with only 6 months of cycling experience, my results were very impressive. It was a great way to start the results discussion! My cycling V02 Max was 49 as compared to my age group norm of 37.8 (and in the “excellent” range on the chart above!). He believes that if I were to do the running test, my max would be 55, as typically running V02 Maxs are higher. My Lactate Threshold is 40 as compared to the average in my age group of 28.3. The most interesting part of my test was that my lactate threshold is at 95% of my maximum heart rate. I hit lactate threshold at 177 bpm, yet my max heart rate was 186. This is unusual, as it is typically believed that LT occurs in trained athletes at 85-88% of maximum heart rate (75% for non-athletes). Ken also informed me that my V02 Max occurred at 217 Watts and I maxed out at 270. He said that for someone with my training experience, these were great numbers. My power to weight ratio is 3.3 which is considered “good” for the average woman cyclist (4 out of 5 on a scale ranging from poor to excellent). He said that this number as well as my V02 Max will improve with training. He told me that although cycling is my limiter in triathlon now, it doesn’t have to be. He said he sees good potential for me to be a great cyclist! These zones are based off of the charts that indicated that my Lactate Threshold was 95% of my maximum heart rate. Therefore, my zones are higher than most of Ken’s clients. He warned me that if I start training with a heart rate monitor and feel like these zones are too high, that I should e-mail him and he can reassess the zones. He said I should do all my long rides at the bottom of my zone 2, at about 151-155. Ken’s test also indicates how many calories per minute I burn at each level of work. He also can tell how many calories I’m burning from fat versus calories from carbohydrates I’m burning at each level. He said that my body actually burns a good percentage of fat in the lower zones which of course is a good thing when you have a practically unlimited supply of fat and only 2,000 calories of carbohydrates in your body. 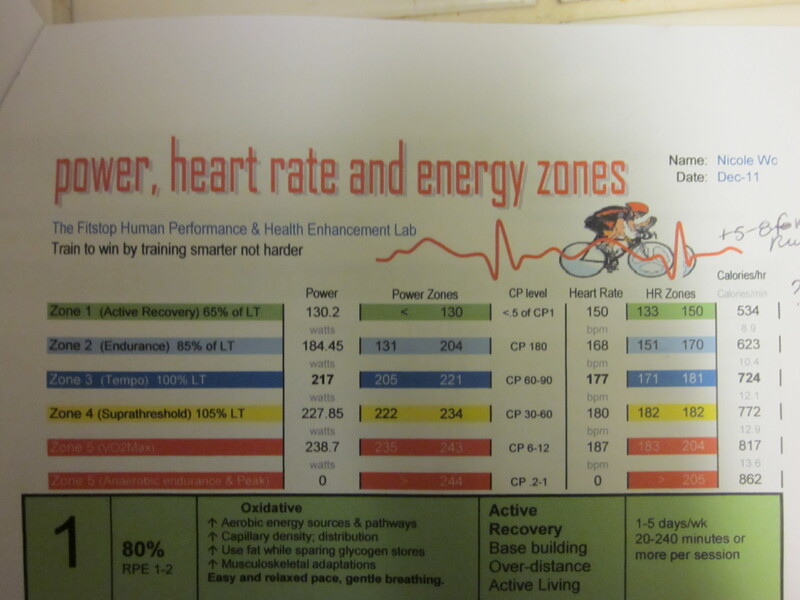 He gave me this handy chart which tells me that I burn about 1/3 of my calories from fat in zone 2 and 0% of my calories from fat at lactate threshold and above. He also mentioned that in my early training rides, I should avoid consuming a lot of gels and what not so that I can teach my body to rely on fat instead of carbohydrates. However, once the race approaches, I need to start consuming the same amount of carbohydrates as I plan to during the race to get my stomach used to that volume. 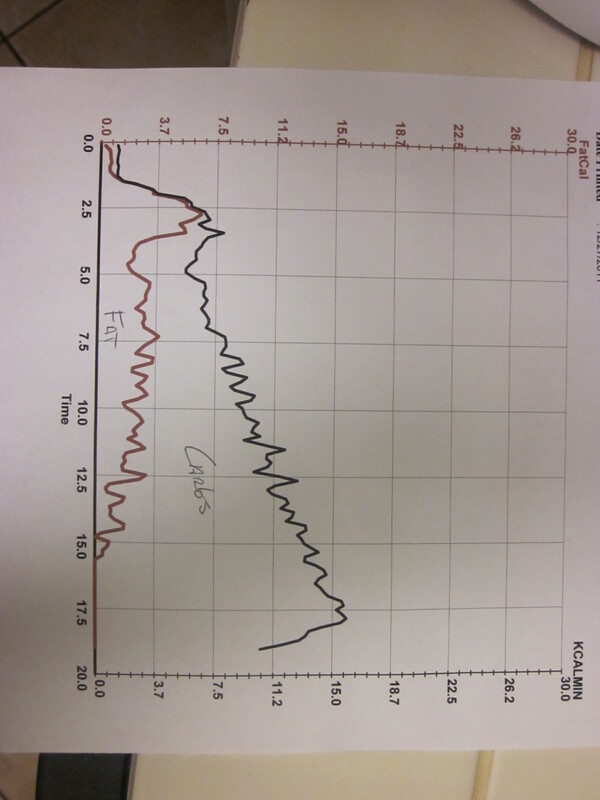 Another test that Ken conducted as a skin fold body fat test. He used a machine to test a skin fold of my tricep, just above my hip, and my mid-thigh. 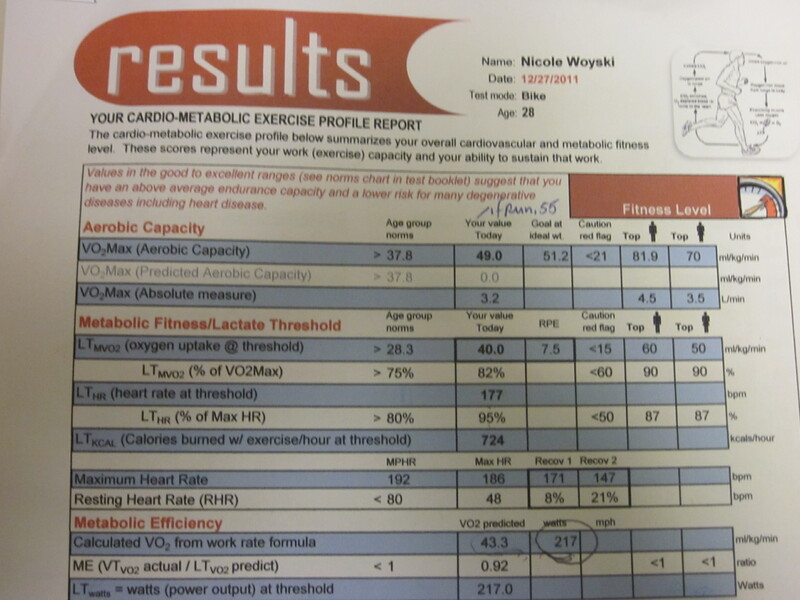 He also used my height, weight and waist circumstance to determine that I am 14% fat and 86% lean. I was pleasantly surprised with this number, as its on the low end of the athletic range for women. He said that I do not need to lose weight, but the program is designed to predict your V02Max at the body fat percentage of 12% for women. The test predicts my V02 Max would go up to 51.2 if I were to lose 5 pounds. I don’t plan to actively try to lose weight but if it naturally happens during Ironman training, I won’t be against it if it makes me faster! Another cool thing about Ken’s test was that it gave me an indication of how many calories I burn on the average day and how many calories I burn during cycling. On an average day when I don’t work out, I burn about 1775 calories. If I perform 1 hour of moderate exercise (in zone 2), he estimates that I burn an additional 608 calories. My packet of results included 5 scenarios of activities I could perform each day and how many calories I need to take in that day to either maintain or lose weight (create a deficit of 500 calories a day for a weight loss of 1 lb a week). I wish I could get tested every month! But yeah I would love to come back later and try again. I’m sure my threshold will be pretty high when the Ironman rolls around!